Individuals with a National CDA (NECC) or Birth through Five credential (FCCPC) must complete the renewal process at least every five (5) years to maintain an active credential. For more information, please see the following information from the Department of Children and Families. You may also see the following link for information regarding staff credentials. Please see the following link from the Office of Early Learning website for more information on VPK staff qualifications. A Bachelor’s Degree in elementary education, if the pre-k instructor has been certified to teach children any age from birth through 6th grade, with a Florida Educator’s Certificate, regardless whether the certificate is current or not, and has not had this educator certificate suspended or revoked. Copy of the Emergent Literacy for VPK Instructors course. Copy of a student performance standards training course (Standards for Four Year Olds). Copy of Level 2 Background screening completed in the past 5 years. Copy of notarized Affidavit of Good Moral Character. A Level 2 background screening, as well as a signed and dated Affidavit of Good Moral Character, must be completed by each staff member before employment. In addition, he/she must be re-fingerprinted at least once every five (5) years. Please see the following letter from the Department of Children and Families (DCF) for more information on this process. Non-instructional days during your VPK year are days you do not offer VPK instruction (holidays, teacher planning days, etc). You do not receive VPK funding for non-instructional days, even though your center may remain open. For example, a private child care program could decide to follow the Public School schedule and thus their VPK program takes a Spring Break but the center itself is not closed that week. In this case, providers may charge parents the cost for that care, but they must inform parents ahead of time what the VPK schedule will be so parents can make alternate arrangements for non-instructional days if they choose not to attend on those days. If a provider serves children who receive a child care subsidy, they will be paid the full day regular rate for children on non-instructional days. To count as instructional hours, mealtime and outdoor play time must provide activities that nurture and enhance children’s development. Children can attend chapel during VPK hours. Nap time CANNOT be counted as instructional time. Providers have flexibility in how they structure their instructional hours as long as they meet the required number of instructional hours during their calendar year. This schedule should not change except under extreme circumstances and prior approval from the Coalition. Providers must offer 540 instructional hours for the School Year VPK program. School-year programs cannot begin before the school district’s first day and must end by June 30. Providers must offer 300 instructional hours for the Summer VPK program. Summer programs cannot begin before May 1 and must end before the start of the school district’s first day of school for the new year. Each VPK class must have in attendance at least four (4) children with eligible VPK certificates in order to begin instruction for funding. Providers may organize their VPK classes to combine VPK and non-VPK children as a blended class, but cannot exceed the maximum class size, the teacher to child ratio, or the licensed room capacity. The Florida Standards for Four Year Olds describe age-appropriate understandings related to the ways four-year-olds think, recreate, reason, and create as they engage in the learning process. Training has been developed to ensure all VPK teachers effectively design and implement suitable early learning environments. The participants will be introduced to the Standards for Four Year Olds, which are guidelines that describe what children should know and be able to do at the end of their VPK experience. VPK lead instructors with either a National CDA (NECC) or Florida Child Care Professional Certificate (FCCPC) are required to complete the five hour online DOE-approved course Emergent Literacy for VPK Instructors. To register for the Florida Standards for Four Year Olds or Emergent Literacy for VPK Instructors, log on to the DCF Website: http://www.dcf.state.fl.us/programs/childcare/training.shtml, click on ‘Training & Registry Login’ on the left hand side. Curriculum must be developmentally appropriate, designed to prepare a student for early literacy, enhance the age-appropriate progress of students in attaining the state adopted performance standards, and prepare students to be ready for kindergarten based on the statewide kindergarten screening. For VPK Providers, you can easily implement your choice of curriculum as long as you are not a Provider on Probation (POP) who selected "curriculum" in your Improvement Plan. If you are a POP who selected "curriculum" in your Improvement Plan, you will have to select and purchase an approved VPK curriculum available on the Voluntary Prekindergarten (VPK) curriculum page here. VPK Assessments - Click Here for More Information! VPK child records are confidential and must be kept by the provider for at least five (5) years after the child’s last day of attendance. Records include Certificate of Eligibility, Parent Attendance Verification Forms (Attachments 14 & 15), and signed VPK Attendance Policy (sample-Attachment 4). The parent of a VPK child has the right to inspect and review the individual records of his or her child and to obtain copies of the records; original documents must remain in the child’s file. Records of the VPK director and instructors must be kept for at least five (5) years after the employee’s last day of employment. 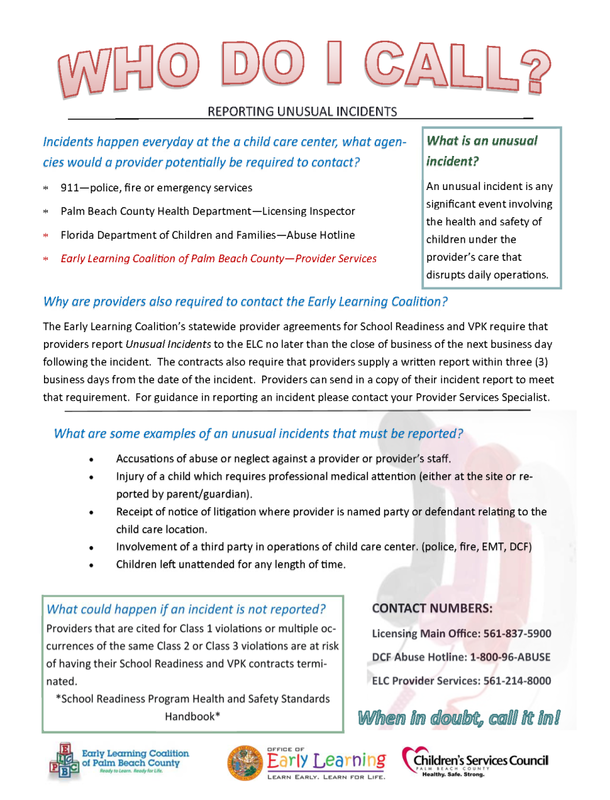 The Early Learning Coalition of Palm Beach County (ELCPBC) has an ongoing duty to verify a VPK provider’s compliance with Florida Statutes, state policies, and ELC procedures. Provider must agree to allow the Coalition’s monitors to visit their VPK programs during VPK hours. Provider must also agree to allow the Coalition’s monitors to review their attendance, lesson plans, and observe their classrooms. The provider’s non-compliance with any terms of the VPK Provider Agreement may result in the Coalition withholding funds and/or the termination of the VPK contract. The provider must submit for approval a corrective action plan before returning to the VPK program. The Coalition will notify the provider in writing of any contract/financial penalties. Please visit our Quality Supports & Monitoring page for the requested documents for monitoring list, tip sheet, copies of the School Readiness (SR) and VPK Monitoring tools, as well as Post Audit Attendance Monitoring (PAAM) information. Per Paragraph 70 of the School Readiness agreement/contract, Paragraph 65 of the Voluntary Prekindergarten (VPK) agreement/contract, and Paragraph 67 of the Children's Services Council (CSC) Scholarship agreement/contract, providers must "report unusual incidents to the Coalition by no later than the close of business on the next business day of the unusual incident and to submit a written report to the Coalition within three (3) business days from the date of the incident. For licensed providers, sending a copy of the incident report submitted for the Department of Children and Families (DCF) to the Coalition shall constitute compliance with this [requirement]." According to the above mentioned agreements/contracts, an "unusual incident" is described as an event involving the health and safety of a child while in the provider's care and/or any incident that may cause a disruption in the provider's operation. Specific examples include "accusations of abuse or neglect against the provider or provider's staff; the injury of a child which requires professional medical attention at the provider's site or written notification from the child's parent that the child received professional medical attention; and when a provider receives notice of litigation where the provider is named party or defendant and which relates to the provider's operation at any location at which [School Readiness, VPK, and/or CSC Scholarship] services are being provided." Please complete the annual CCR&R update on the Office of Early Learning (OEL) Provider Portal by May 31 of each year. According to Florida Statute Rule 6M-9.3000, Providers must provide an annual CCR&R update to maintain compliance with the Voluntary Prekindergarten (VPK), School Readiness, and Children's Services Council (CSC) Scholarship agreements/contracts. Parents will then be able to know what their options are within the county. This is also a great way to advertise your facility and its programs. VPK Providers must provide parents/legal guardians with a copy of their written attendance policy upon enrollment of each child into the VPK program. Parents must sign signifying they agree to the provider’s attendance policy. Signed documentation must be kept in the child’s file for monitoring purposes. Please note that a provider’s attendance policy is not the same as the State’s VPK Funding Policy. Providers have the right to determine how many absences/tardies are allowable. Children who complete 70% (including paid absences) of a VPK program will be included in that program’s readiness rate. Parent must submit the Certificate of Eligibility to provider to ensure funding. Provider enters the child information to Roster on the portal. A provider may enroll a child in a VPK classroom after the class has begun, if at least 10% of the instructional hours remain (54 hours for a school year program or 30 hours for a summer program). The parent/guardian must complete and sign the “Informed Parent Consent” form. A child may transfer only ONE TIME -if they have completed less than 70% of the VPK program hours- regardless of circumstances. Providers may accept children with approved transfers; however, the parent must submit the new Certificate of Eligibility prior to enrollment. Providers will not receive payment without a newly issued certificate. As a reminder, a provider should not return the Certificate of Eligibility to a parent if their child disenrolls. The provider is required to maintain the certificate in the child’s file for five years. Please see the following link for guidance and information regarding VPK re-enrollment, as well as an application for re-enrollment. VPK provider may not require a parent/legal guardian to pay fees or charges for any part of the VPK program, including, but not limited to registration fees. However, a provider may request that a parent voluntarily purchase or bring in personal items such as: instructional materials or supplies, lunch, snacks, or hygiene products (e.g. tissues, soap). A provider must notify the parent/legal guardian in writing of scheduled pick-up periods for the VPK program and the fees or charges for late pick up. This notification must be reviewed and signed by the parent/guardian. If a parent fails to pick up his/her child from the VPK program by the designated time, the provider may require payment of late pick-up charge.